There are now 30 self-proclaimed climate-concerned House R’s. This new bill could be their gut check. The day after the Congressional climate solutions caucus added its 30th Republican member, a dozen U.S. Senators, all Democrats, introduced a bill that could help gauge how serious these House R’s are about tackling the climate crisis. 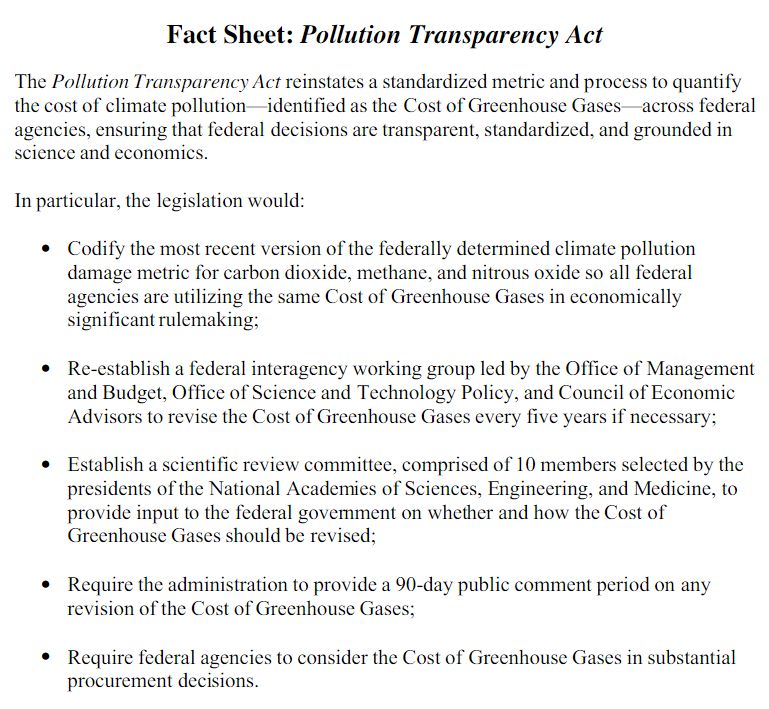 The Pollution Transparency Act, sponsored by Sen. Michael Bennet and 11 fellow Senators including Warren (D-MA), Wyden (D-OR) and Whitehouse (D-RI), would establish a federal interagency working group to codify a cost of carbon dioxide and other greenhouse gases to be used in federal rule-making, cost-benefit analysis and other administrative actions. From office of Sen. Michael Bennet (D-CO), lead sponsor of the Pollution Transparency Act. Coincidentally, or perhaps not, the climate solutions caucus reached a new milestone yesterday when it inducted its its 30th Republican member, Rep. Mimi Walters, from California’s Orange and Riverside Counties. The caucus, created and sponsored by the non-partisan Citizens Climate Lobby, has been admitting Republicans and Democrats in matched pairs since its formation in early 2017. There’s no shortage of Democrats eager to join, so the limiting factor is the other, largely climate-denying side of the aisle. The Bennet bill, summarized at left, would effectively codify, in legislation, the “social cost of carbon” (SCC) promulgated several years ago by the Obama administration and used in federal rule-making until recently. A number of states have adopted regulations based on the Obama SCC; for example, in 2016 the NY Public Service Commission calibrated its “zero emission credit” subsidy for nuclear power plants to the SCC. To be sure, the SCC is a very imperfect benchmark, as we and others have noted repeatedly. It also falls far short of a carbon tax or price; by itself it will incentivize only a tiny fraction of the myriad behavioral changes, technical innovations and cultural shifts that an actual carbon or greenhouse-gas fee would spark. Yet administrative recognition that emitting greenhouse gases imposes a cost is valuable. So too would be the symbolism of Republicans amounting to one-tenth of sitting G.O.P. representatives and senators — officially resolving that unpriced burning of fossil fuels isn’t quite free. And if they act in concert, the members of the climate solutions caucus could gain a modicum of political cover against the ruling denialist line while casting their first public vote for climate action. A companion bill to Sen. Bennet’s has been introduced in the House by Rep. Donald McEachin (D-VA-4), according to Bennet’s press release, which also lists as a key endorser a leading Republican economist: Glen Hubbard, Dean of Columbia School of Business and Chairman of the Council of Economic Advisors under President George W. Bush. When facing a precipice, the first step away is the most critical. Will these climate-aware Republicans take it? As much as it would be most welcome for the Climate Solutions Caucus to come together to support a specific price for the SCC, this vote might not be the most accurate test of the unity or power of the caucus. The caucus is still working on finding common ground, and it might not show “its hand” just yet. Good things are worth waiting for. haven’t read the article but there are over 40 who voted to maintain climate change research funds on the last military appropriation bill So 30 on Caucus but 40+ we can count on (I’m hoping) They just haven’t joined the Caucus yet. Have there been proposals to send dividends back through EBT cards to low-income persons?